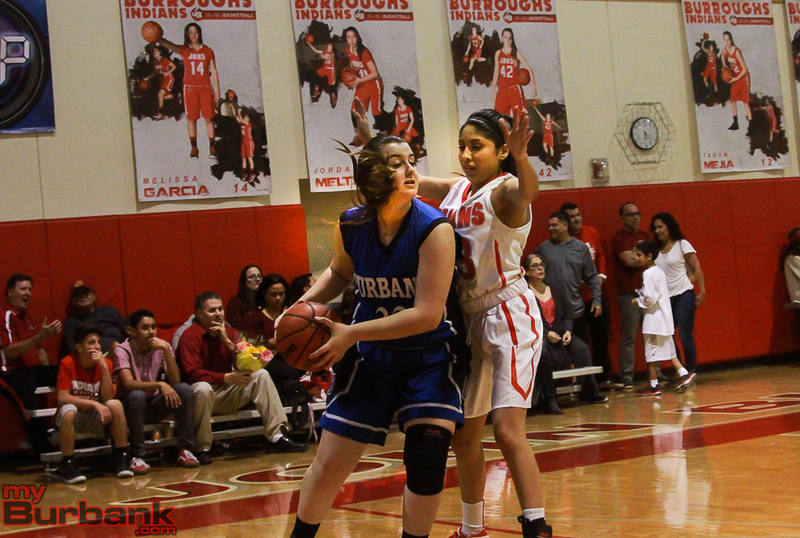 For the third consecutive season, the Burroughs High girls’ basketball team went undefeated in the Pacific League after pushing aside visiting Burbank on Thursday, 46-34. The Indians, who have now captured four straight league crowns, are the No. 6th ranked team in the CIF Southern Section Division 1-A, and await Sunday’s playoff pairings. Junior guard Kamryn Cardenaz led the way for the Indians (21-7 and 14-0 in league) with 11 points followed by nine points each from senior guard Abbey Ibarra and senior guard Brooke Radcliff. Radcliff’s basket with 6:51 left in the fourth quarter gave the Indians a 30-16 edge. 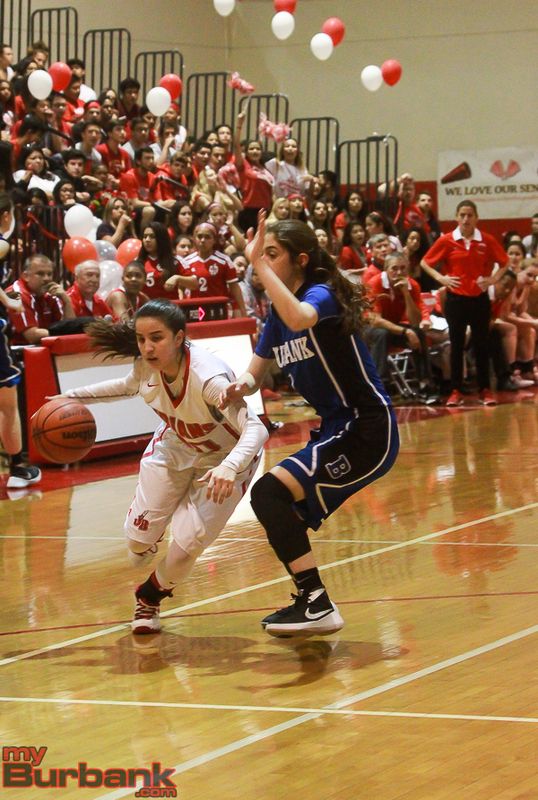 A hoop from Cardenaz made it 34-16 with 5:20 left before Burbank freshman shooting guard Osanna Tirityan nailed a three-pointer with 2:43 left that trimmed the lead to 36-24. When junior small forward Sabrina Zakarian hammered in a three-pointer and 29.6 seconds showing the Indians’ lead was 44-32. 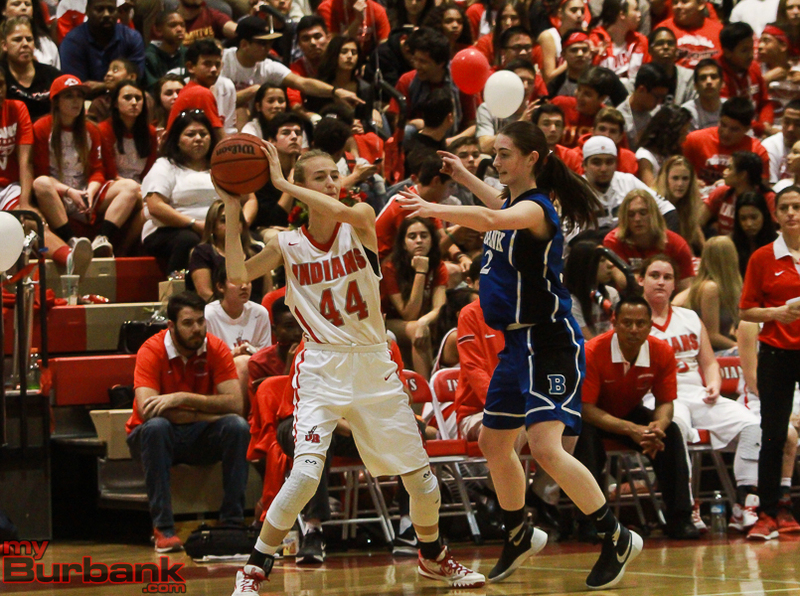 Another steadying force for Burroughs was senior guard Jordan Meltzer, who chimed in with eight points. 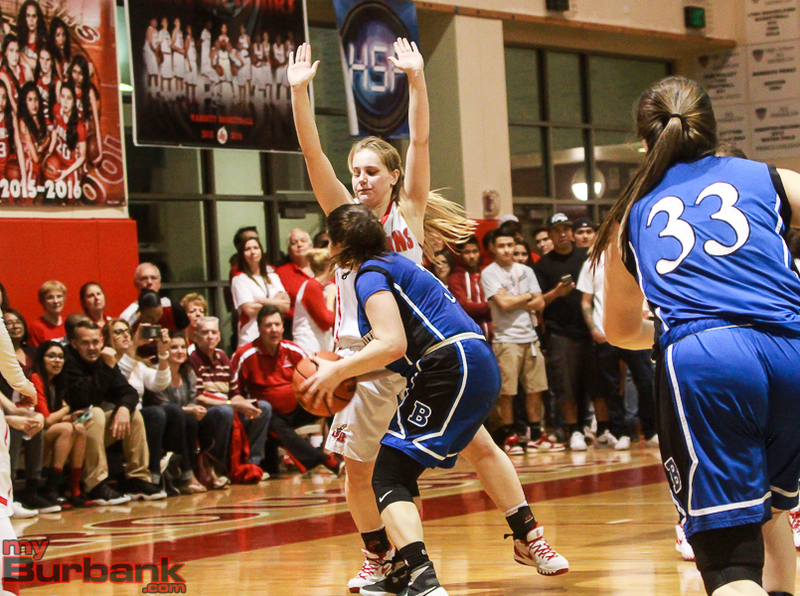 In the clutch, Meltzer canned six of six free-throw attempts in the fourth quarter. 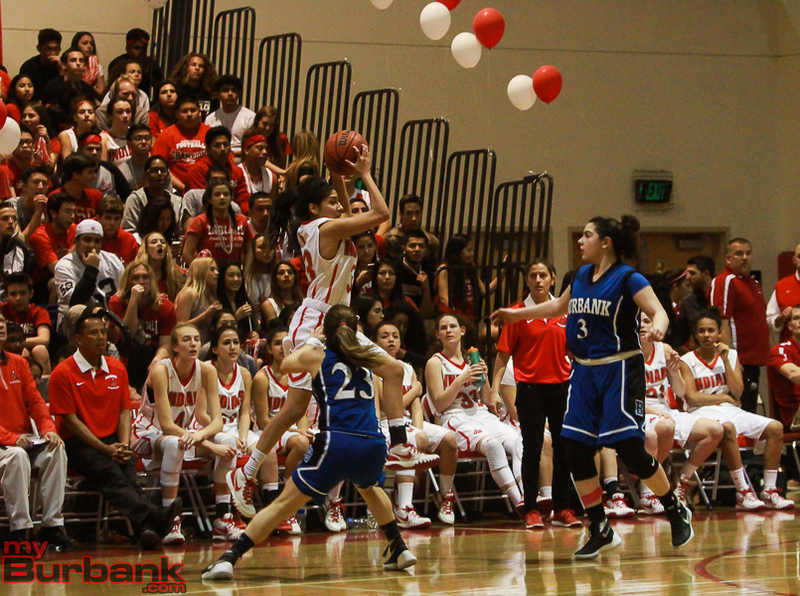 Burroughs (35.4 percent on 17 of 48 from the field) held Burbank (13 of 38 for 34.2 percent) scoreless in the first quarter. 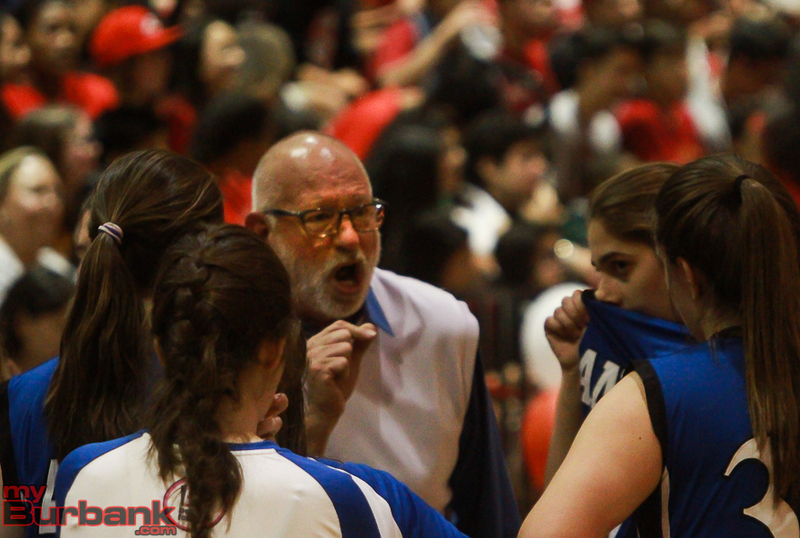 Burbank (18-10 and 8-6 in league), which finished fourth in the league and will also be in the playoffs, missed six shots from the floor in the opening period. Meanwhile the Indians converted three of 10 and tallied eight points in the initial stanza with Ibarra scoring five points. 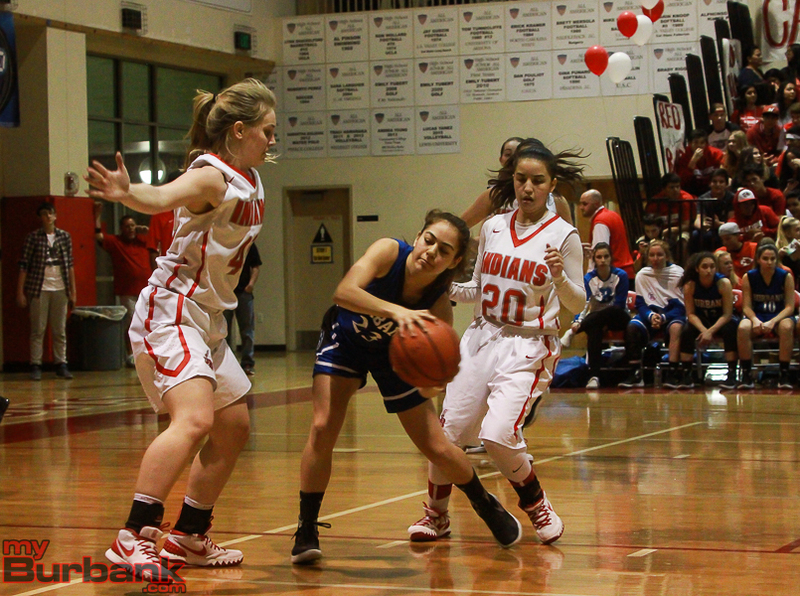 Part of Ibarra’s outburst was the only three-pointer hit on the evening by the Indians. 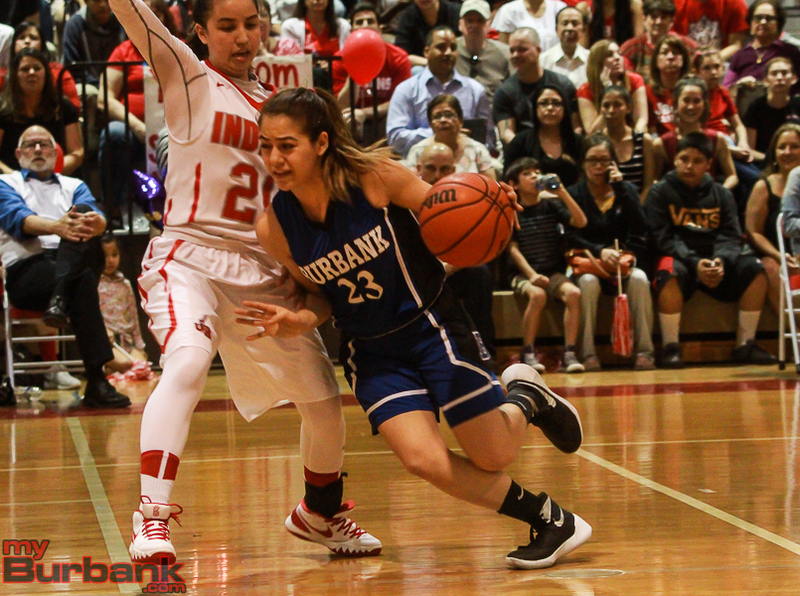 Burroughs outscored the Bulldogs 8-7 in the second quarter with Ibarra, Meltzer, senior guard Melissa Garcia and Cardenaz all scoring two points. 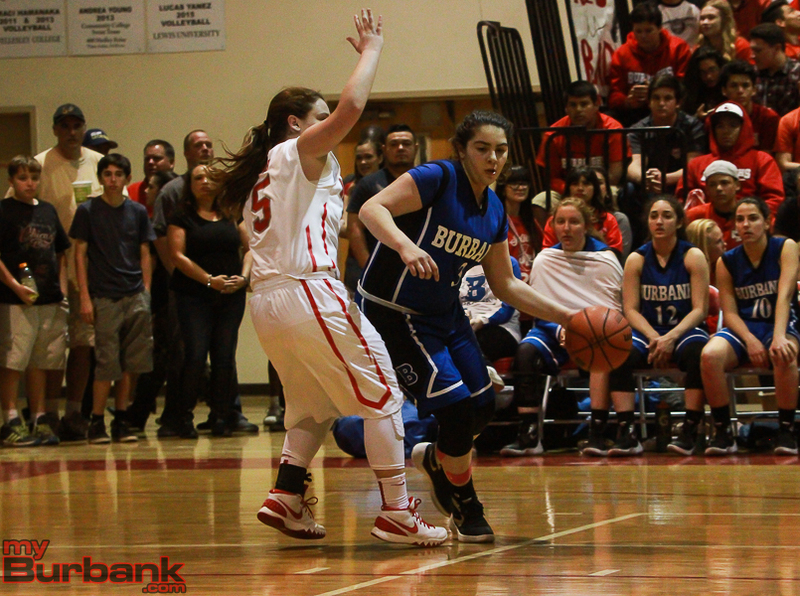 Zakarian (seven points) nailed a three-pointer for Burbank in the second quarter. Burroughs nailed 11 of 25 shots for 44 percent in the second half after making six of 23 for 26 percent in the opening half. The Indians continued their strong effort in the third quarter with Radcliff tallying five points while Cardenaz dropped in four points. 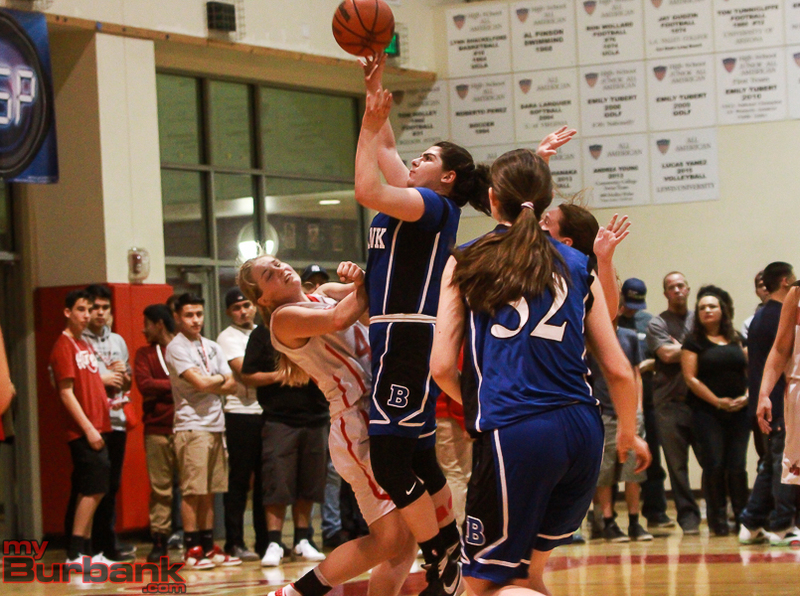 Burbank countered with four players scoring in the third quarter including junior center Emma Kerr (six points), Tirityan (game-best 13 points) and senior point guard Celine Shamalian each scoring two points. 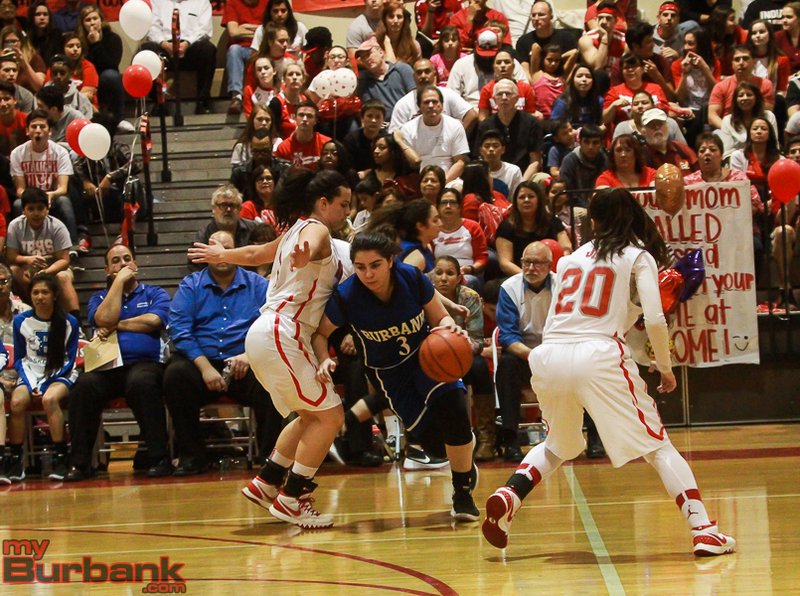 Burbank trailed at the half, 16-7, and was outscored 30-27 over the second half. Aside from Meltzer’s six charity tosses in the fourth quarter, junior forward Haley Wilson (six points) scored four points as did Cardenaz while senior guard Taryn Mejia scored all of her two points. Tirityan had a fourth quarter she’ll remember for a long time as she poured in 11 of her team’s 20 points that included a trey. Senior power forward Christina Mkrtchyan scored her only hoop in the fourth quarter and junior small forward Stephanie Grigorian dropped in a bucket in the second quarter for the Bulldogs who trailed 28-14 after three quarters. 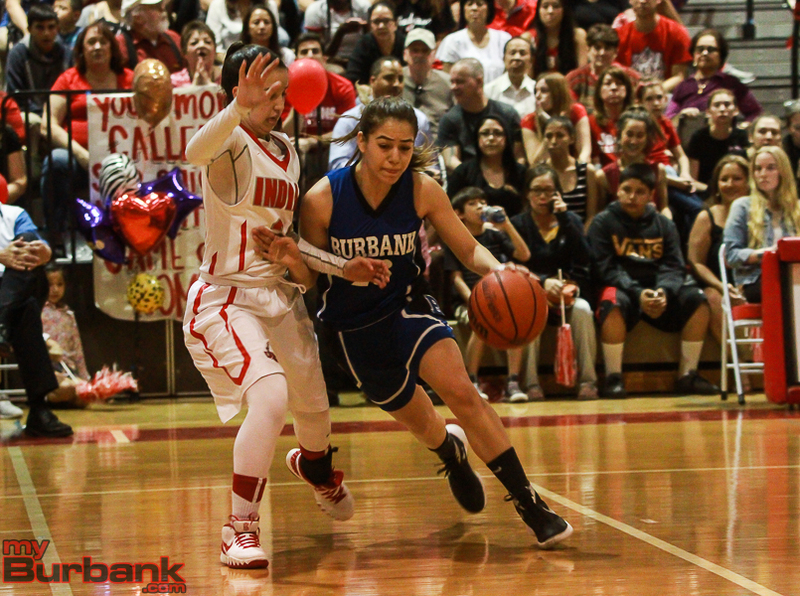 This entry was posted in Girls Basketball, Sports and tagged Burbank, Burroughs, girls basketball on February 12, 2016 by Rick Assad.